Update: added new event on 19th May. Yune will perform in three live events in May (in addition to her appearance at Mirei Hoshino’s birthday event). May 3rd, Yune heads to Saitama, a short ride north of Tokyo to guest at an idol live. There will be at least seven idols / idol units appearing. There will also be goods sales and a chance meet Yune. This is during the Golden Week holiday so it should be a fun live. May 12th Yune will appear at a large event featuring 17 idols and idol units. She will also do an interview for an idol website during the day, which you might be able to watch. As usual there will be goods sales and a chance to meet Yune. Finally May 19th is an event in Shinjuku again with many idols appearing. Yune will sing and run goods sales afterwards. When: May 3rd, 2018. Part 1 starts at 12:00. 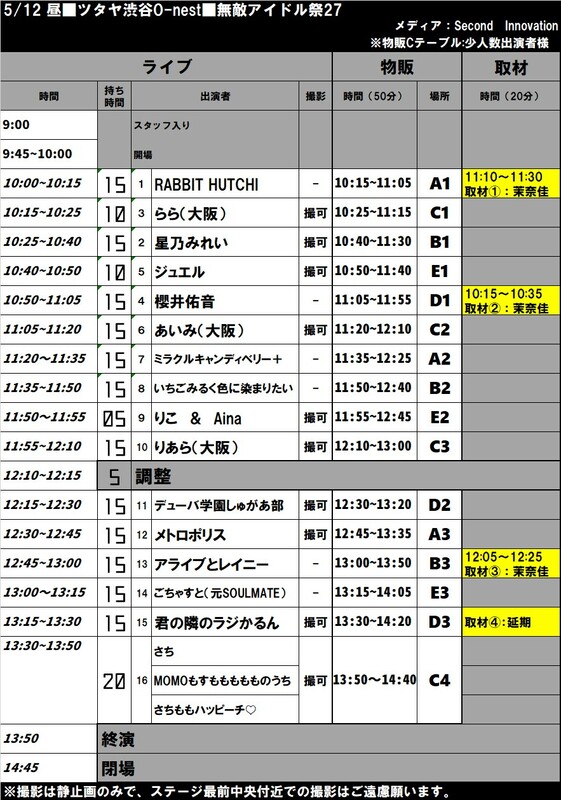 Yune’s turn is from 13:05 to 13:20, with goods sales from 13:20 – 14:20. There is also a part 2 of the event, but Yune does not appear. A very short walk from Kita-Yono station, which can be reached easily in 30 minutes from central Tokyo. The venue has a large sign and is easy to see on one corner of a crossroads. Tickets: 2500 yen if you make a reservation or buy in advance, 3000 yen on the door. Either way you must also buy one drink ticket (500 yen). Advance tickets can be bought at livepocket, but you can more easily make a reservation directly with Yune to get the entry discount – see below. When: May 12th, 2018. The event opens at 09:45, and the show runs from 10:00 – 13:50, goods sales until 14:45 (full schedule in Japanese). Yune’s turn is from 10:50 – 11:05, with her goods sales straight afterwards until 11:55. She will also do an interview for an idol website from 10:15 – 10:35, which you might be able to watch. Tickets: 2000 yen if you make a reservation (see below), 2500 yen on the door. Either way you must also buy two drink tickets (1000 yen). When: The time of Yune’s turn on stage has not been decided yet. This entry will be updated when it is. Tickets: 1500 yen if you make a reservation (see below), 2000 yen on the door. Either way you must also buy one drink ticket (600 yen).